Our Dehumidifying Air Handler is a mechanical dehumidification concept with using plate heat exchanger equip together with cooling coil in order to condense water vapour in the air at highest efficiency performance. Plate heat exchanger helps to reduce required capacity of cooling and heating. When cooling coil is smaller and heating coil is not required, cost of accessories and installation is automatically reduce. There are two types of dehumidification concepts. 1. 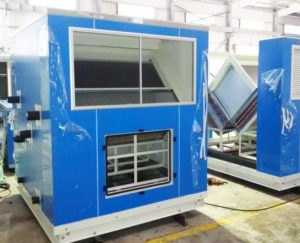 Mechanical dehumidification which is condensed vapor water in the air with cooling surfaces. The result is dry and cool. 2. Chemical dehumidification which is absorb vapor water in the air with its chemical characteristic then regenerate (reject wet air) it with hot air to bring back that absorbed ability. The result is dry and hot.